Aug 5 Just Finished Reading This. You Should Start. "That is when AI (artificial intelligence) meets AI (artificial insemination," is indeed one of my favorite parts of this book. The author is quoting a Microsoft VP who's telling a story about data collection from dairy cows in Japan - it's one of several illuminating examples of how our world is changing faster than we can keep up. And, no, you won't find this book in my Little Free Library. 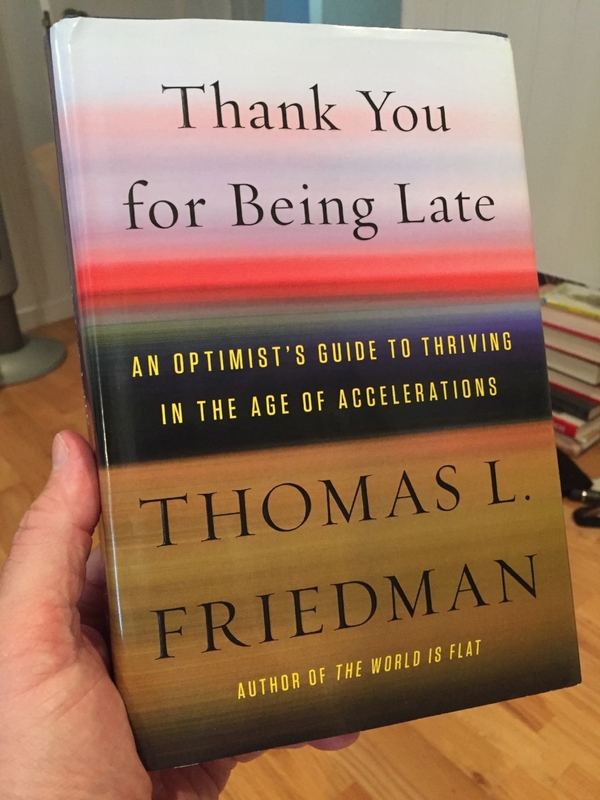 I'm hanging on to "Thank You For Being Late", Thomas Friedman's latest book. I was visiting my 85-year-old parents when I started reading this, and I stopped so many times to share bits with my dad that I thought I might never finish the first 100 pages of this 450+ hardcover. Part modern tech history and part visionary ... it's always personal and memorable. You could read the first half or so and get more than your money's worth. The book grabs you like a web video featuring puppies and babies. Friedman tells a tale that's both philosophically optimistic and intellectually pessimistic. That oversimplifies a complicated non-fiction piece that outlines how we reached this current information age, and how we're handling its evolution and ours. From the first chapter: "Indeed, there is a mismatch between the change in the pace of change and our ability to develop the learning systems, training systems, management systems, social safety nets, and government regulations that would enable citizens to get the most out of these accelerations and cushion their worst impacts. This mismatch, as we will see, is at the center of much of the turmoil roiling politics and society in both developed and developing countries. It now constitutes probably the most important governance challenge across the globe." "Thank You For Being Late" is packed with historical reference, international insight, and personal reflection that left me better informed and better equipped for global citizenship. A bit too much? Well, Friedman does take on a great deal in this book, and it's not without his own political slant. Since his mostly matches mine, I'm good with that. Yes, I'm a big fan of Friedman's work. It began with "The World is Flat," and expanded with this latest which includes a closing section that ties his youth in Minnesota to a bigger worldview. It's like two, maybe three, books in one. You might skip the Minnesota part, but I didn't. I spent my first 40 years living near Friedman's birthplace of St. Louis Park. He connects his Minnesota memories to current people and work in the state, and it all fits well with the past-present-future themes in the book. You can borrow my copy, just don't look for it in my library. Aug 8 Words First. Tools Second.